InstallBuilder installers are not Java-based, so they do not require bundling a Java Runtime or a self-extraction step. The result is crossplatform installers that are smaller and faster than those generated with competing products, which reduces download, startup and installation time. 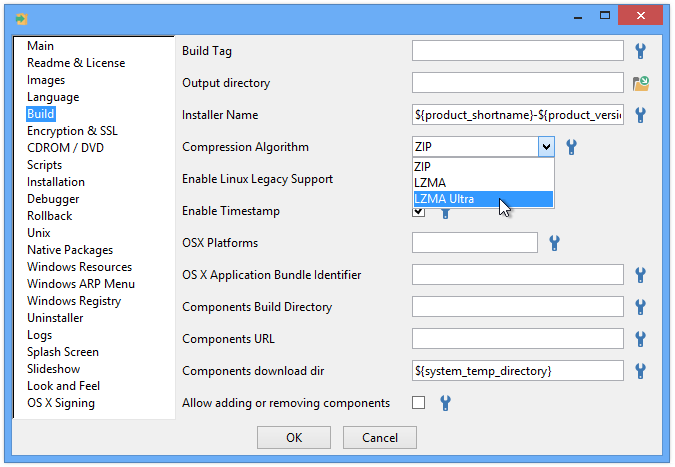 InstallBuilder 19 includes a new compression algorith (LZMA-ultra) that allows even higher compression rates and faster decompression speed at runtime. It also includes a revamped unpacking mechanism that greatly reduces the time spent in extracting the packed files while decreasing the memory usage of the process. This new system, along with LZMA-ultra, will make your installers even faster and smaller!